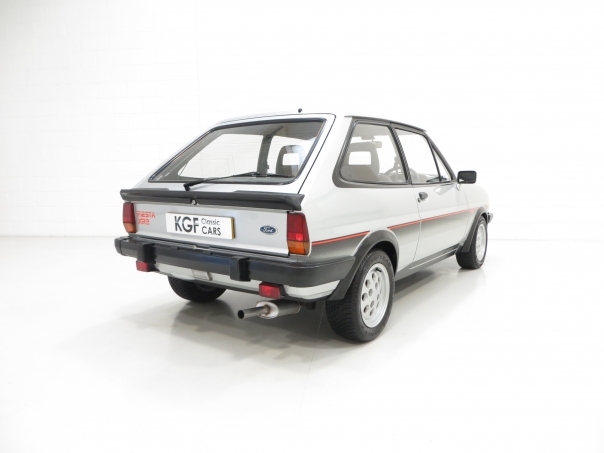 An iconic Ford Fiesta Mk1 XR2 with just 70,690 miles. Louvred design radiator grille with aerofoil section, aerodynamic front and rear black spoilers, black wheelarch extensions, twin body coloured doors mirrors, special XR2 bodyside decal treatments, extended black window surround paint, storage compartment under rear-floor, two speed plus intermittent wipe, tailgate wash/wipe, heated rear window, tachometer, trip recorder, driving lamps, soft feel steering wheel, perforated ‘Cool Black’ headlining, digital header mounted clock, cigar lighter, illuminated interior controls. 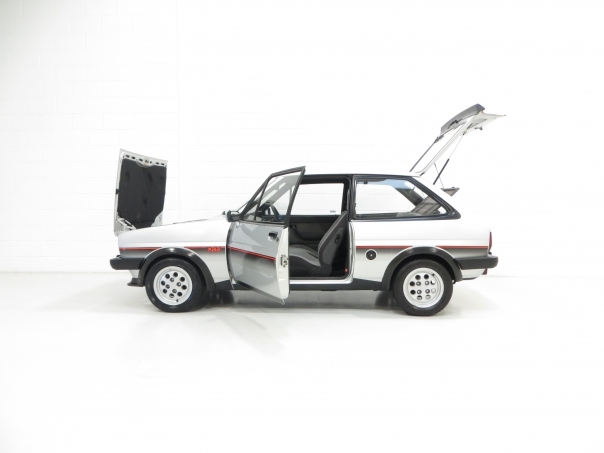 Dealer fitted: Audioline cassette player, immobiliser. 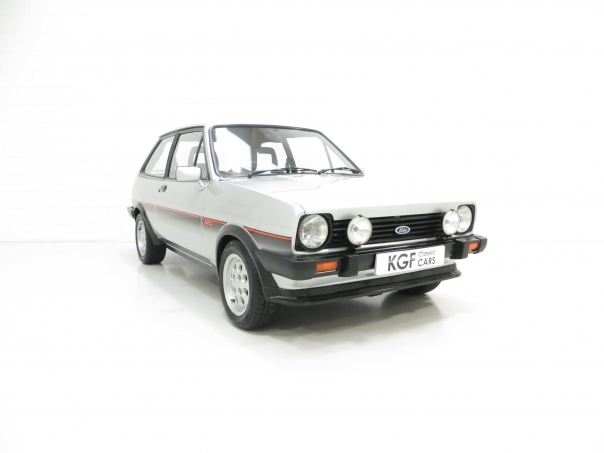 This sporting Fiesta is finished in striking Strato Silver, (Code V6) and boasts a uniform, polished shine throughout. All panels are straight with linear gaps and only tiny touched in chips to the bonnet, a small blemish to the tailgate and marks to the tape stripe are worthy of mention. This car has been a successful entrant in the XR Owners Club Concours D’Elegance with judging forms proving the high scores and top rankings. 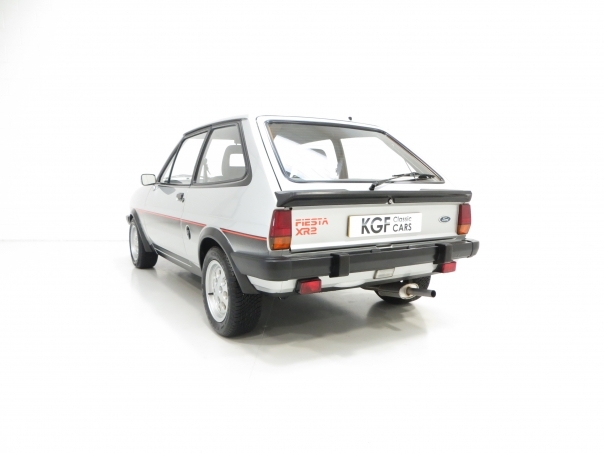 The factory standard trim sections and bumpers are free from markings and all rubbers are soft and black. All glass is number plate etched and the correct Ford Hella rear lamps and Lucus H4 headlamps are fitted. A rare vehicle itself, and rarely surpassed in this condition. 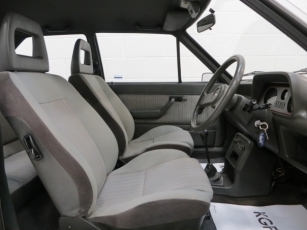 The interior in this remarkable example remains in beautiful condition and largely as Ford intended other than a period Audioline cassette player and period alarm. The ‘Storm’ and Crushed Velour interior in Shark Grey, (Code KW), is immaculate and free from tears, rips or discolouration. The red laser line around the console is bright and unbroken and the soft finish dashboard is perfect. The Shark Grey loop pile carpet is spotless having been protected by carpet mats and the Grey Mylar sidewall and rear quarter finishers are pristine. All switchgear is functional and the original trimmed parcel shelf is intact, straight and complete with the correct rubber hangers. 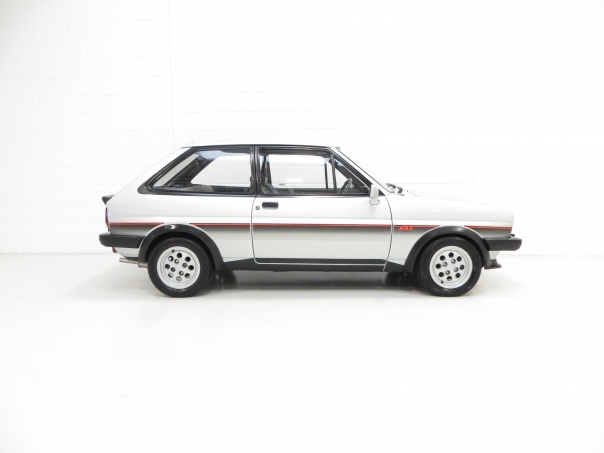 A delightfully period unspoilt interior, reminiscent of the 1980’s hot hatch phenomenon. The time proven transverse mounted 1600 OHV engine with Weber twin-venturi carburettor develops an ample 84BHP which in such a lightweight and nimble car helps achieve a top speed of 105mph and 0-60 in 9.3 seconds. The standard specification automatic choke and electronic ignition are both present and the noise from the standard rear Ford exhaust is unmissable. All factory stickers and identification plates are visible within a very clean engine bay. The four speed synchromesh gearbox with remote shift is light and exact, a joy to use. A real ‘smile on your face’ experience. Special ‘pepperpot’ 13” X 6” alloys wheel with ultra low profile branded 185/60HR13 tyres adorn the car and amazingly have never been refurbished. A few markings are visible. 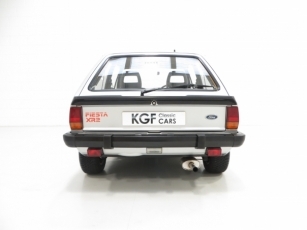 The spare alloy wheel sits in the boot wheel housing which incorporates the correct ‘bulged’ rear lower valance designed to accommodate the enlarged alloy wheel compared with lower Fiesta models. The dual line servo assisted brakes with ventilated 9.4” front discs and 7.0” rear drums bring the car up to a steady, straight and assured halt. Registered new on 11th August 1982 by Ford Main Dealers Central Garage Hucknall Ltd, this enthusiast owned example has only ever had five former keepers. All the handbooks, instruction guides and original service book are neatly contained within two A4 folders brimmed with history. 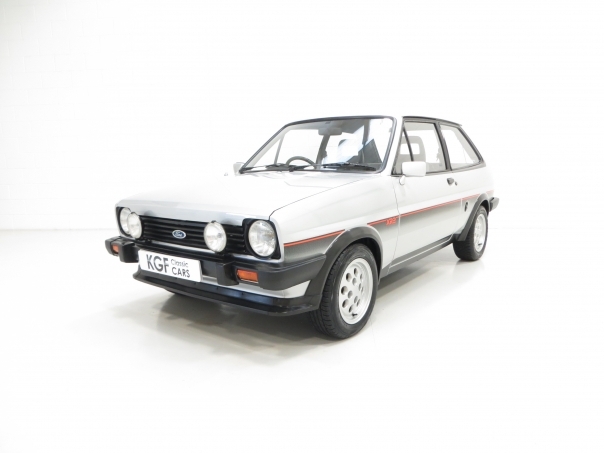 This comprises of old MOT certificates, tax discs, invoices, XR Owners Club material and entrance cards to various shows where the car was a main exhibit. As a memento of its previous success on the show circuit a number of scored judging forms are included. 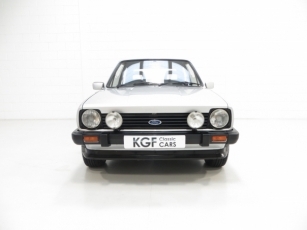 Last sold by KGF Classic Cars to a discerning Ford collector we are proud to be able to offer this vehicle again to the next lucky custodian.